San Diego Chargers quarterback Philip Rivers warms up before his game against the Patriots. Courtesy of San Diego Chargers Facebook. 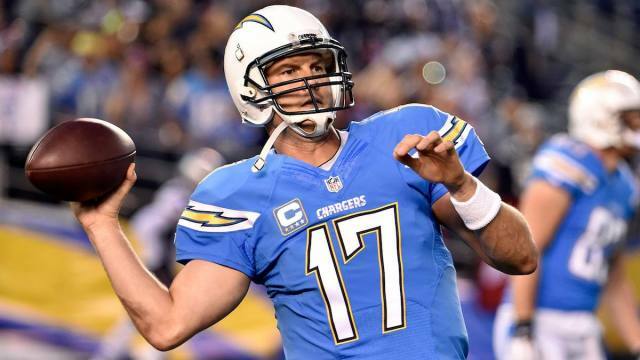 The San Diego Chargers were defeated 23-14 by the New England Patriots on Sunday Night Football at Qualcomm Stadium. Playing with its fourth different center of the season, the Bolts offensive line struggled to give Philip Rivers adequate time to throw the ball against a stout Patriots secondary. Rivers was sacked four times, and was hit a total of eight times on the night. What made the stagnant offensive play more upsetting was the defensive effort the Chargers put together. After giving up a combined 61 points in the last two weeks, the Bolts had the high powered Patriots offense scratching their heads all night. The defense held the Patriots to just three points going into halftime thanks to an interception from middle linebacker Manti Te’o late in the second quarter. They also added a touchdown on a 52-yard fumble recovery from safety Darrell Stuckey midway through the second quarter, after fellow safety Jahleel Addae jarred the ball lose from New England wide receiver Brandon LaFell. “We definitely are proud of how we played but it just wasn’t enough,” cornerback Sharece Wright said post-game to Chargers.com. With a 14-3 lead the Chargers had ample opportunities to put the game out of reach for New England thanks to the defense forcing four straight punts to open up the second half. However, the Bolts were not able to muster any fire on offense, and did not score a single point in that span of punts from the Patriots, or the second half in general, and New England would not punt again the rest of the night. A field goal, and a touchdown to tight end Rob Gronkowski brought the Patriots within one point, and another field goal with 10 minutes left in the game gave New England its first lead since the first quarter. New England put the nail in the coffin its next offensive possession with a 69-yard touchdown pass from quarterback Tom Brady to wide receiver Julian Edelman. The offensive unit, which guided the Chargers to victory their last two games, failed to get anything going besides a touchdown pass to Malcolm Floyd early in the second quarter. With a fierce pass-rush in his face all night, Rivers would finish 20-33 with 189 yards, and was intercepted once. There was also no sign of a running game , as running back Ryan Mathews led the team with 44 yards on 11 carries. Now the Chargers (8-5) welcome division foe Denver Bronocos (10-3) as they continue along the toughest final four games for any team in the NFL based on opponents record.